As a marketer, every once in a while, I come across a marketing campaign that I find well executed that inspires me to write about it and give it some props. 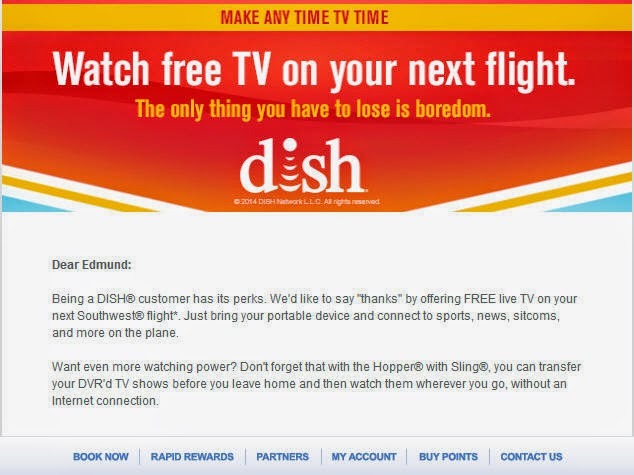 Southwest Airlines and DISH Network are co-op marketing partners. 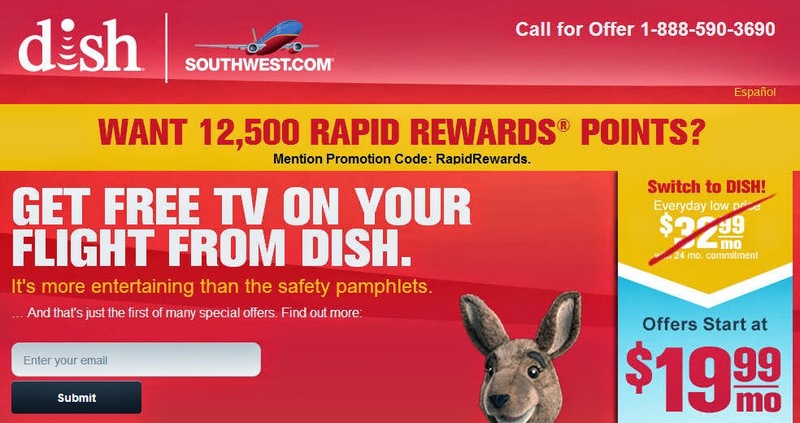 For example, here's a co-branded marketing landing page where new DISH customers can get a boatload of Southwest Rapid Rewards points and save on their monthly subscription to Dish. Then there is this great "surprise and delight" marketing example. The day before a recent Southwest flight, I got the below email from Southwest with the subject line: Your Southwest Flight Tomorrow: Watch TV For Free! Totally unexpected and timely. It soooo improved my flight experience. 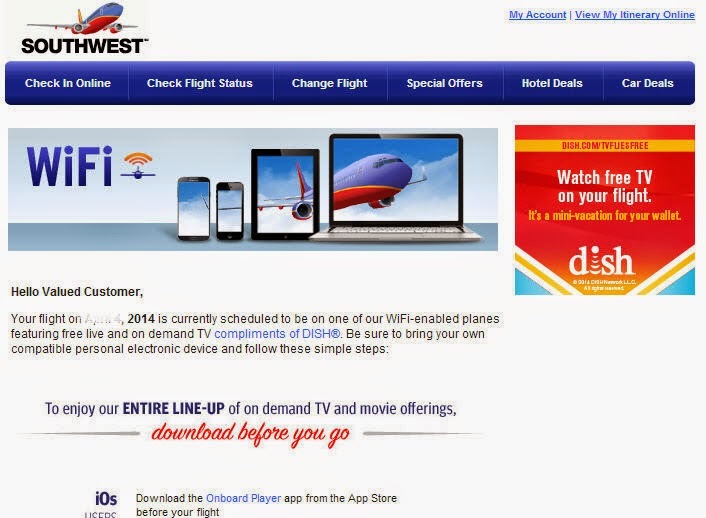 It also made the Southwest flight experience more in line with Jetblue's DirecTV in-flight offering. The above is not an uncommon marketing practice for customer acquisition. So, here's where things get interesting. What about EXISTING customers of DISH and Southwest? This week I received this email. Once again, a great subject line to lure me in: Get free live TV on your next flight. Unlike the previous email, I was greeted by my first name. Not Dear DISH Customer or Dear Valued Customer like above. Not hard to do since Southwest obviously knows my name from my Rapid Rewards account. But it starts out by saying "Being a DISH customer has its perks." This implies the 2 companies cross-referenced their customer database for this targeted email and knows I'm a DISH customer already. This kind of personalization is not rocket science, but so many marketers don't apply this simple best practice. The only critique I have is there is no clear CTA, a wasted marketing opportunity. While it says I just need to bring a portable device, it doesn't tell me how I will redeem the offer. Do I need to have my DISH login or account info handy? Or my Rapid Rewards number? Or maybe I'm still skeptical and don't believe it's just as easy as bringing my iPad. I'm a bit surprised there is no hyperlink to Learn More. Often, marketing programs are focused on customer acquisition. Nothing wrong with that. But once in a while, there's something for customer retention and this is a great example! Also, this is not a "big data" application by any means. But just good ole fashioned smart marketing.